Visiting the ruins of Pakuba Lodge, Idi Amin’s favorite hideaway in Murchison Falls National Park, is a rare treat. 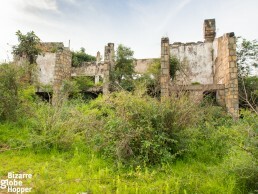 There are just a few remnants left in Uganda from Idi Amin’s atrocious regime. Once the pride of Murchison Falls National Park, the grandiose Pakuba Lodge caught the eye of Idi Amin, who turned it into a State Lodge, his private retreat. The legend has it that Idi Amin spent much more time in Pakuba than in his official presidential residence in Kampala. Pakuba Lodge welcomed Idi Amin’s inner circle as well as international guests of honor and is praised in several memoirs. I remember seeing a photo of the old Pakuba Lodge in some travel magazine years before visiting Uganda. The sight had haunted me ever since. 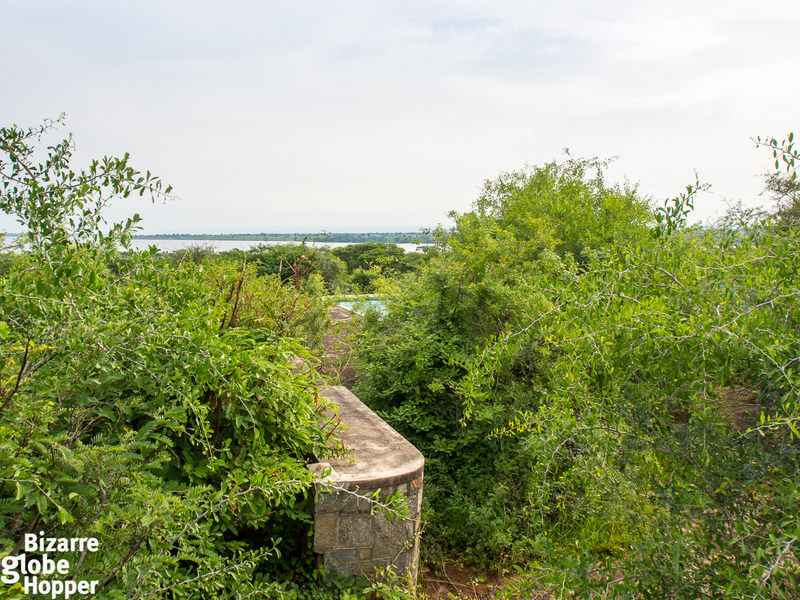 The lodge seemed to stand alone in the wilderness, upon the serene waters of White Nile, and the name of Idi Amin loaded the image with ominous enigma. 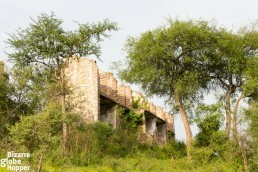 The derelict of the historic Pakuba Lodge rests deep inside Murchison Falls National Park, in northwestern Uganda. The area has Africa’s highest numbers of Nile crocodiles; one of the predators that Idi Amin loved to hunt for sport, among lions and other big game. During Idi Amin’s rule, for example, the elephant population of the park collapsed from 9000 to the one scared herd of 160 elephants. It’s also told that tons of human corpses were thrown into the Nile, and drifted through the Murchison Falls, called Kabalega Falls at the time, only the be devoured by the notorious Nile crocodiles. Fortunately, wildlife populations of Murchison Falls have recovered from the violent poaching of Idi Amin’s era. 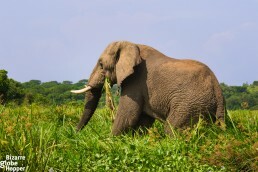 For us, Murchison Falls National Park offered great lion sightings, and we saw also a gigantic python from a zero distance. Murchison Falls is the biggest national park in Uganda, and among the best for sure. Don’t forget to take a boat cruise on the Nile to spot the infamous crocodiles and other wildlife, and admire the falls! 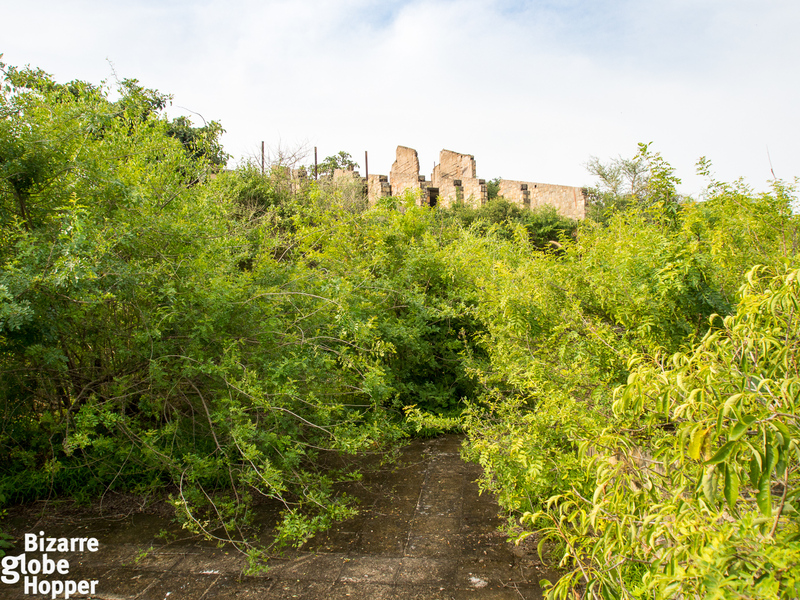 If you are visiting Murchison Falls, take a small detour to explore the ruins of Pakuba Lodge. It’s probably on your way if you’re doing a couple of game drives in the park. 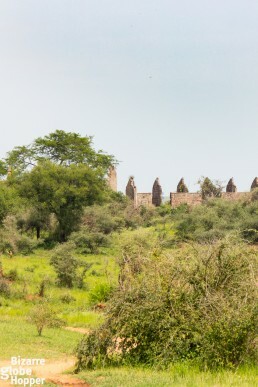 Your guide knows the way, and you can tour nearby bushes and riverfront making it a proper game drive with a break at the Pakuba ruins. Visiting the old Pakuba Lodge is allowed only with an armed ranger. We were accompanied by a tourist police from our hotel and our guide. 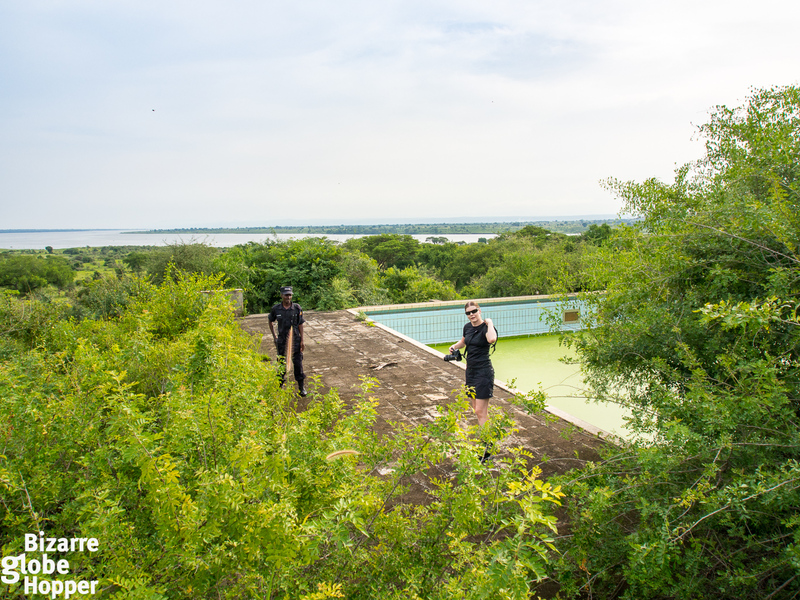 There are plans to renovate the Idi Amin’s beloved lodge, but we haven’t heard about any progress. 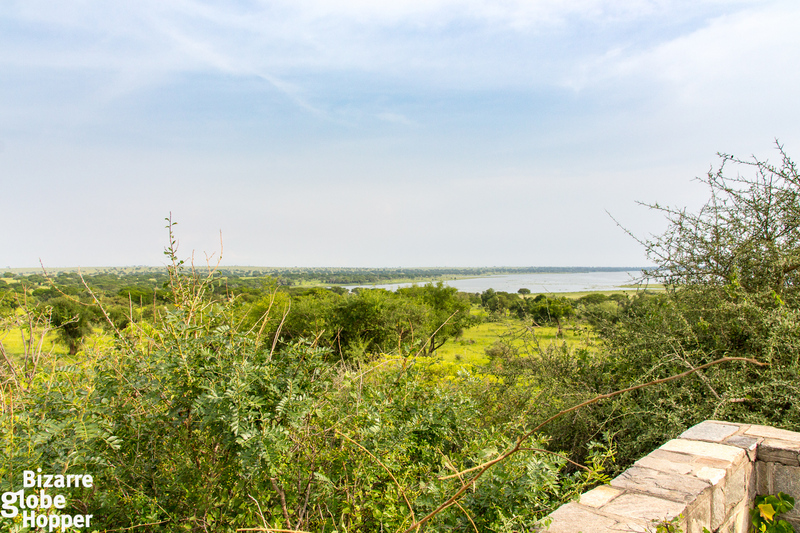 I had a vague memory of a majestic, low-rise and wide stone complex that was standing alone upon the serene waters of White Nile. 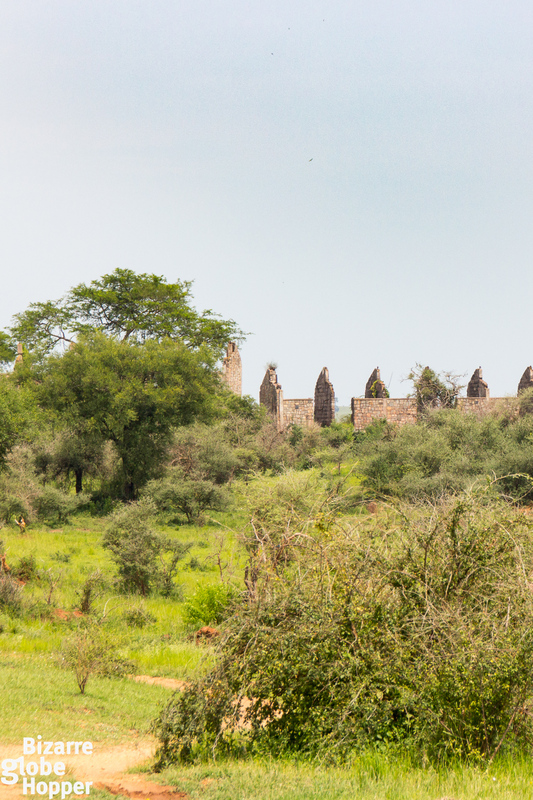 When you are visiting Pakuba Lodge ruins, you’ll approach the location from the opposite direction, seeing just some crumbling stone piles rising from the bushes. You’ll notice the isolation, though, as there are no other lodges nearby. Our loyal Land Rover struggled to climb the steep, overgrown path leading to the hilltop. 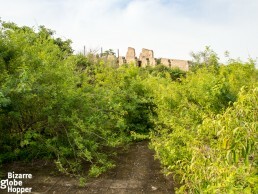 It was evident that the site doesn’t decorate wishlists of ordinary tourists: no-one had penetrated these bushes with a car for a while. A strange feeling hit me when we reached the hilltop and were welcomed by a clearance in the front of the overgrown reception. The tourist police asked our guide to park the car at the exact spot of the former parking lot. 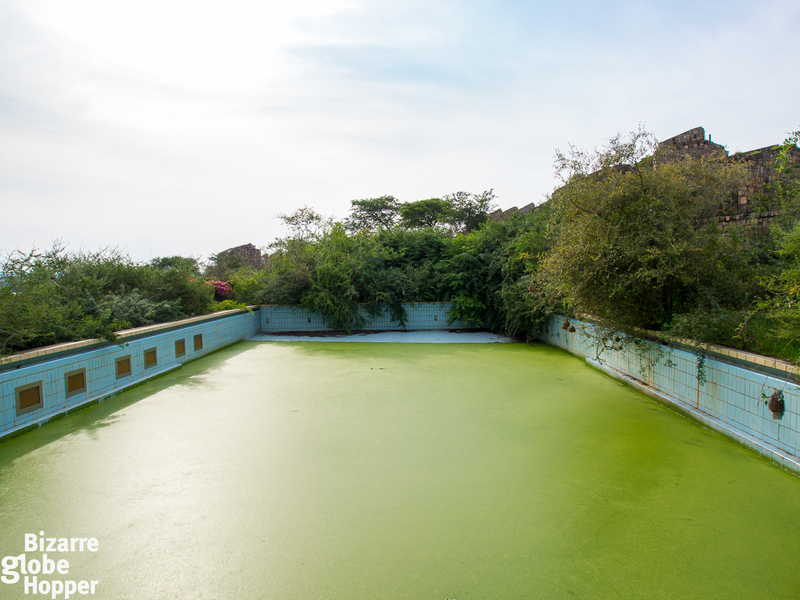 My mind was busy imagining this abandoned hotel in full colors, without overgrown vegetation. I was already seeing the staff hurrying towards us with cool towels and fruit juices on the tray when we were told to jump out and start our exploration. Off we plowed through knee-high vegetation, stylishly unprepared in our short skirts. Silent tourist police led us towards the northern wing of the old Pakuba Lodge, pointing where the kitchen and housekeeping facilities had located. He finally seemed to open up a bit, giving up to our visible fervor and answering our hesitant questions with short stories as we passed different sections of the former State Lodge. When we came around the building, we could, at last, see the fabled view, which is praised in so many memoirs. 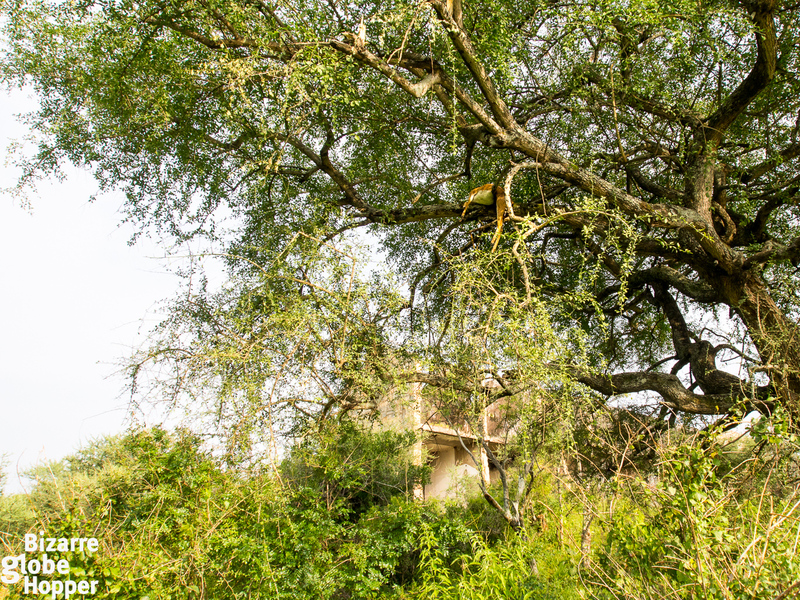 Pakuba Safari Lodge was built on the hilltop, facing the photogenic junction of the two Niles and Lake Albert. You can see all the way to the DRC, which was one of the reasons why Idi Amin loved this location. Idi Amin’s tribe, Kakwa, originates from Zaire (now known as the DRC); it was also where he smuggled ivory and gold to trade arms. Murchison Falls used to be the most visited national park in Africa and mecca for hunting, which was obviously the other reason Amin was so fond of this hideaway. 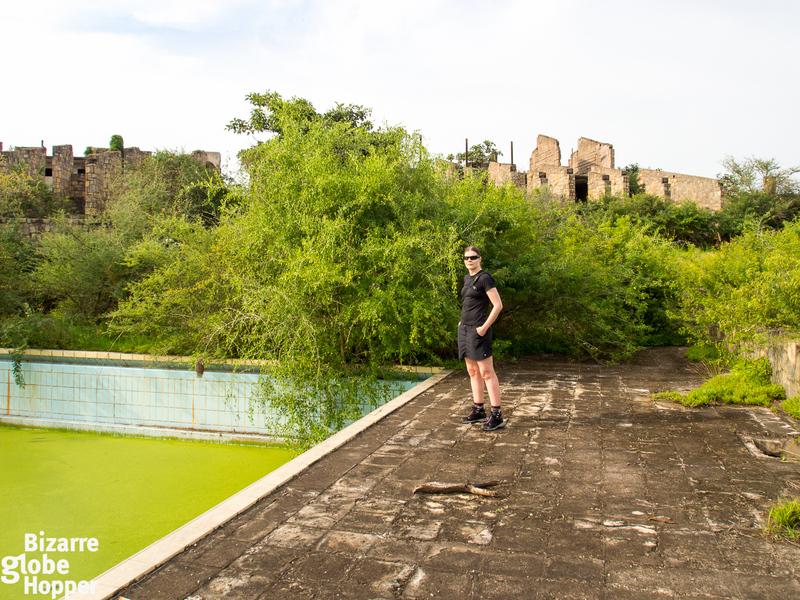 We strolled around the Pakuba ruins, admiring the view and the quiet solemnity that surrounds the former Idi Amin’s State Lodge. Hippos were grunting at the shore, and a herd of elephants roamed at the distance. It’s fairly easy to imagine the former Pakuba Safari Lodge in its heyday since a wrecked skeleton of the whole hotel complex rises from the high grass. The tourist police told us that two-story building had accommodated 160 people. 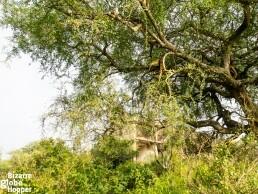 Each room had a balcony overlooking the Nile junction and Zaire. The old Pakuba Safari Lodge was designed by the Danish architect Hans Munk Hansen, and 4-year building process was finished during the Idi Amin’s era in 1974. 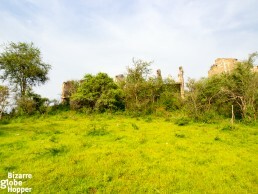 The lodge was built from the local stone; now decayed and eroded in rains. What you can’t see are the balconies and roof structures which were made out of Eucalyptus tree. In the middle of the two wings was the main building with a restaurant, lounge, bar and a large terrace. 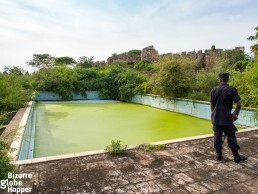 Out of a sudden, the tourist police plunged through dense bushes but soon came back to tell that we could follow him to the swimming pool area. He had just checked that there weren’t any leopards or lions lurking at the site. Vegetation was thick. We hopped cautiously upon a stone rail and penetrated further while trying to keep the balance. It was well worth the effort, though. The swimming pool is clearly the dilapidated heart of the eerie Pakuba Lodge. From here, the view is at its best: on a bright day, Congolese mountains peek visibly upon the Nile junction. 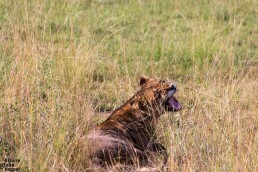 We could hear big cats roaring inside the ruins: the predators have taken over Idi Amin’s paradise. This is their breeding ground, and humans are not welcome. Shady stone piles offer a haven for bringing up cubs and hiding carcasses. After enjoying the grounds for a half an hour or so, the tourist police urged us to proceed, with a slightly jittery tone. We wandered, humbled, around the southern wing and towards the parking lot. Fresh carcasses of an oribi and impala were hanging from a tree, telling that a leopard was probably prowling nearby. We needed to go, the tourist police said even more forcefully. Swimming pool ruins of Idi Amin's Pakuba Lodge in Murchison Falls National Park, Uganda. 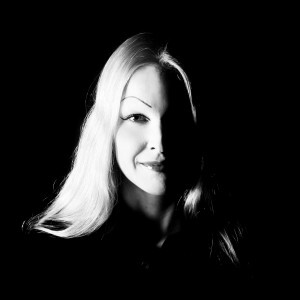 Piritta posing at the ruins of swimming pool. From here you can see all the way to Zaire! Idi Amin’s 8-year reign of horror ravaged Uganda to deep scars. Idi Amin’s regime is held responsible for a half million deaths and bringing one of the healthiest economies in Africa to total ruin. Entire villages were wiped out. Professors, journalists, businesspeople, religious leaders, and ministers just “disappeared”. The ground was so full of bodies that gravedigging got to deadlock, and the corpses were fed to the crocodiles of Nile. But even the crocs couldn’t handle it, and the bodies were seen at the shore in high numbers. Wildlife was annihilated resulting, for example, the total extinction of rhinos and slaughtering 90% of the country’s wildlife. Remember the Idi Amin movie, ”The Last King of Scotland,” which brought Oscar to Forest Whitaker for playing the whimsical tyrant? The movie gives some foretaste to Idi Amin’s erratic and ferocious behavior. Idi Amin claimed to be ”Lord of All the Beasts of the Earth and Fishes of the Sea,” among other titles. He stated that human flesh tastes a bit salty, and was known to collect heads in the fridge of his palace. Idi Amin was undoubtedly one of the most notorious men known to history, who also credited the others, claiming for example that Hitler had been right to kill 6 million Jews. But Idi Amin was also a celebrated cult figure for some, even in other parts of Africa and for example in the Caribbean. At first, he was considered as a black nationalist and a strong, charismatic tribal chief. He knew how to show off in international media, plunging in swimming pools in full military uniform and boasting with numerous wives. Henry Kyemba’s memoir “A State of Blood” sheds a harsh light to the era and Idi Amin’s life, sparing no gory detail of the brutal murders. Kyemba was Idi Amin’s secretary, and the first insider to reveal the atrocities. I would strongly recommend his book if you’re interested in Idi Amin’s regime. We bought ours in Africa, but it’s available on Amazon, as well. For understandable reasons, it’s kind of difficult to find any physical traces of Idi Amin’s bloody regime in Uganda. Ugandans tend to fall silent about their memories, as well. Even at the Pakuba Lodge, one of the staff members told us that nearby Pakuba ruins had nothing to do with Idi Amin, although the history is well-known. From what I’ve heard, there are also the ruins of Idi Amin palace at Lake Victoria, and of course, it’s possible to visit all those unfortunate places mentioned in the history books where the mass murders took place – most of them are on the regular tourist route, anyway. Try to ask from your tour company or guide. 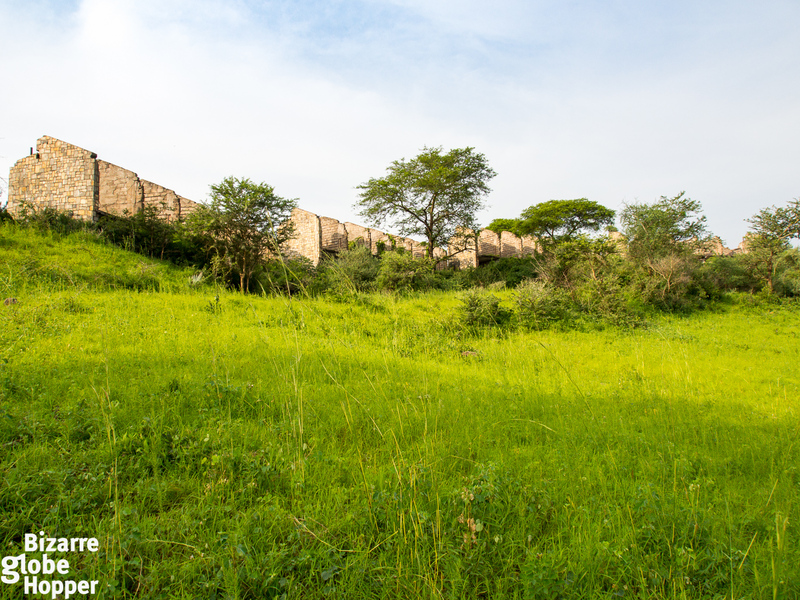 To crown your expedition into the grim history of Uganda, stay at the new Pakuba Safari Lodge, built among the former staff headquarters of Idi Amin’s Pakuba Lodge. The new lodge was built in 2010 in the shadow the hill, where the old Pakuba ruins lie. 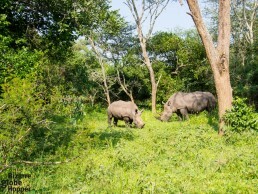 Wildlife roams freely through the property making your stay a constant safari experience. While we were eating breakfast in Pakuba, giraffes peeked into our room. Impalas, hartebeests, and kobs grazed just outside; even elephants wandered around, and big cats roared at the distance. 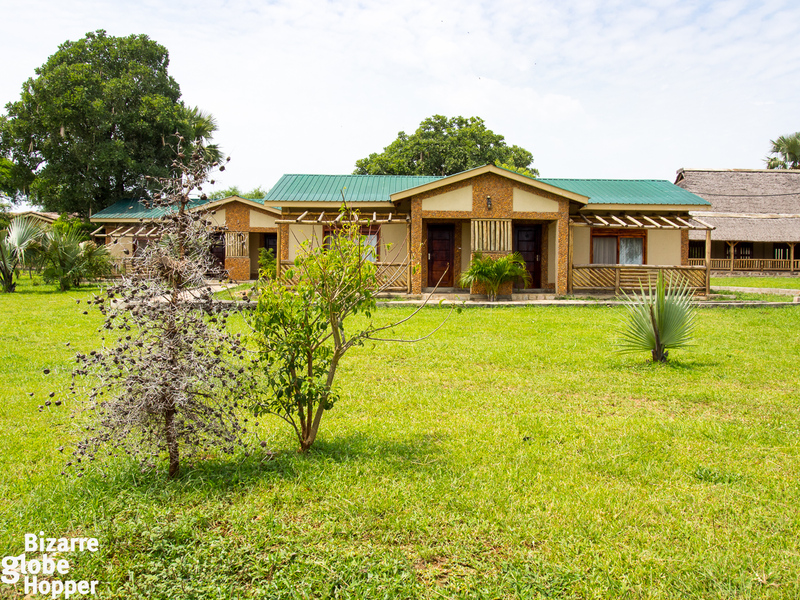 There are not so many lodges nearby in this area, which makes Pakuba Lodge an excellent vantage point for the game drives in Murchison Falls National Park. It’s good that Uganda is not hold up as the “Idi Amin’s country” anymore. Still, I think that tourists should be educated about the bloodshed and chaos that Idi Amin’s reign caused to Ugandan people and wildlife. We enjoyed visiting the ruins of Pakuba Lodge accompanied by grim tales and deep thoughts. Would you enjoy this kind of dark pilgrimage? *Disclaimer: Our safari in Uganda, including a visit to Murchison Falls National Park and Pakuba Lodge, was hosted by Mamaland Safaris. All the opinions and views expressed here remain totally our own. Any good investor is welcome. 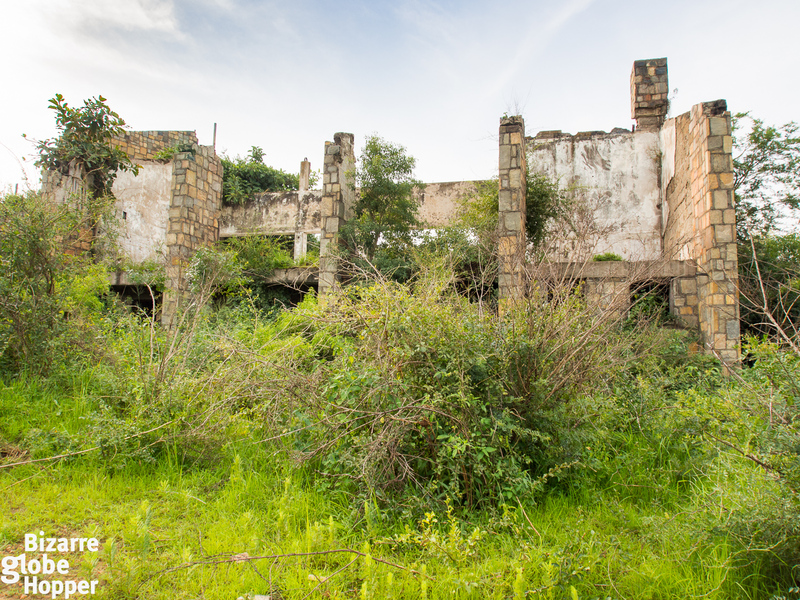 We could invest in maintaining the dilapidated properties, Idi Amin’s two lodges. A procedure from government can be sorted out. Thanks for the information. 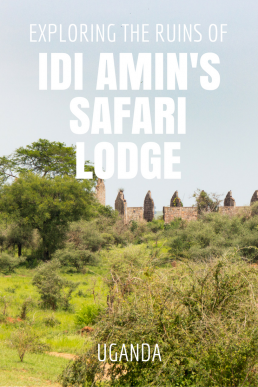 I hope that Idi Amin’s old lodges could be restored and opened for tourists someday. 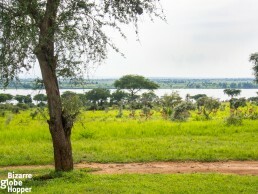 The location of the old Pakuba Lodge is stunning with the views over the Nile junction. It certainly deserves to see a new generation of tourists and a positive future. I wish the project all the best. Please keep us updated. Interesting article. Will be spending a few days at the new Pakuba Safari Lodge and may visit Idi Amin’s former lodge. It is terrible that so many people were slaughtered during that time. What many people don’t know (or care to remember) is that King Leopold II of Belgium committed similar atrocities in the Belgian Congo many decades before (https://en.wikipedia.org/wiki/Atrocities_in_the_Congo_Free_State). Perhaps this is where Idi Amin and other African tyrants learned how to divide, oppress and slaughter people. Hi Cerassie! I’m sure you’ll enjoy your time in the new Pakuba Lodge, the location is serene and animals roam through the property. You can ask one of the rangers to accompany you at the old Pakuba ruins, it’s well worth the quick exploration. Thanks so much for reminding us of those Congo Horrors, they’re definitely not well know and I hadn’t even heard about them before visiting the DRC. That’s an interesting thought pattern: I agree! Despite all these negative vibes around tyrants, we wish you an amazing holiday in Uganda! 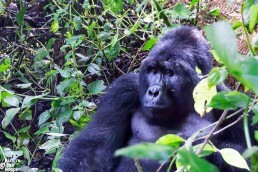 Uganda is still among our favorite countries, where we yearn to return.